ICARUS PARAGLIDING knows that students love to explore, to try new things and to have fun. They know that you’re adventurous! Actually, they strongly agree that the best time to enjoy life is during your varsity years. That is why we have teamed up with them to give you a whopping 20% DISCOUNT! Now you can enjoy one of the most exhilarating activities (tandem paragliding) without breaking the bank! Paragliding is not just fun but amazing, epic, exciting and fantastic. It’s tandem paragliding, so don’t worry about experience or training – one of Icarus’ licensed, experienced and hilarious pilots will “share the sky” with you. Take off from either the spectacular Signal Hill or scenic Lions Head and land at the famous Sea Point promenade or the iconic Clifton beach, respectively. Imagine floating peacefully in the air like a bird, no annoying noise of an engine. Yes, just a fabric wing and a comfortable seat. If you choose to, your pilot will treat you to some crazy acrobatics – talk about a roller coaster. The experience is just awesome! That’s why paragliding is one of the most popular adventure activities in Cape Town. Wanting stunning photos and videos for your Instagram, Facebook and other social media platforms? 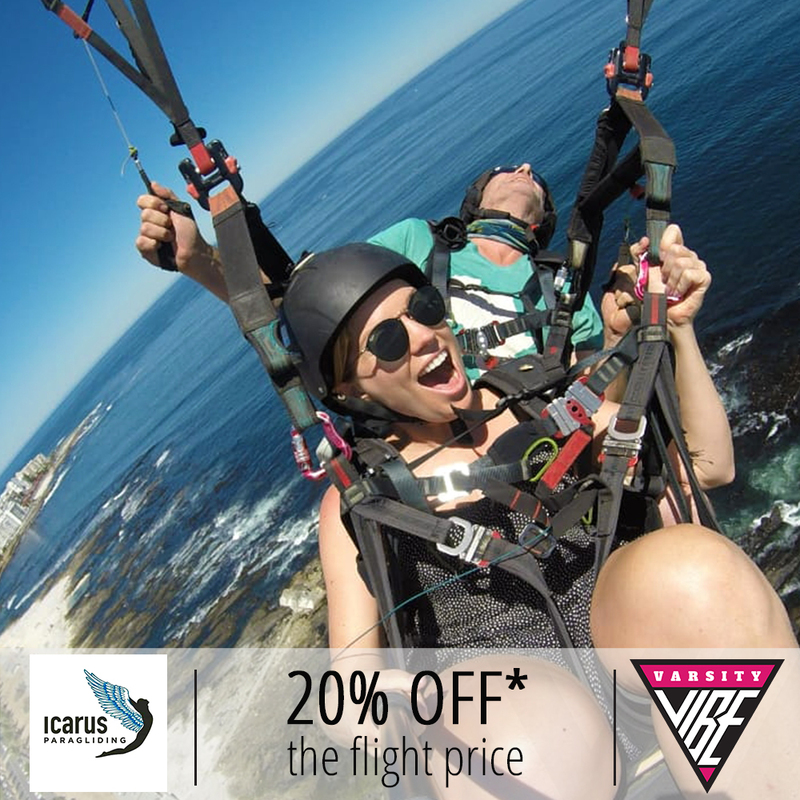 Icarus will capture the whole experience for you! Simply book your flight, show your completed ‘My Profile’ page on the VV App when you pay and enjoy! Let’s enjoy life together. Come let’s share the sky! !